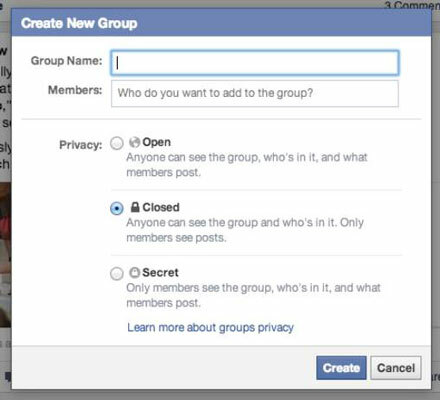 You may find an occasion to create your own Facebook group. As a group’s creator, you’re by default the group administrator, which means that you write the group’s information, control its Privacy settings, and generally keep it running smoothly. You can also promote other members of the group to administrator. This grants them the same privileges so that they can help you with these responsibilities. 1Hover over the left side menu. When the menu expands, click See More beneath the list of your most common destinations on Facebook. This expands the left menu to show all the groups you belong to. 2At the bottom of the list of groups, click Create Group. 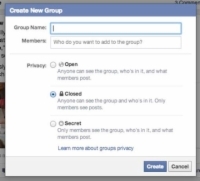 The Create New Group window appears. 3Enter a group name into the Group Name field. Type the names of people you want to add to the group. At this time, you can add only friends as members. Facebook tries to autocomplete your friends’ names as you type. When you see the name you want, press Enter to select it. You can add as many — or as few — friends as you like. If you forget someone, you can always add him later. 4Choose the privacy level for your group. Open: Open groups are entirely available to the public. Anyone can join simply by clicking a Join button; anyone can see all the content the group posts. This type of group is best for a very public organization that wants to make it easy for people to join and contribute. Closed: By default, your group is set to Closed. This means that anyone can see the list of members, but only members can see the content posted to the group by its members. People can request to join the group, but admins (like you) need to approve those requests before the requesters can see group info. Secret: Secret groups are virtually invisible on the site to people who haven’t been added to the group. No one except members can see the member list and the content posted. People who have been added to the group can also add their friends, so if you’re protecting state secrets, you might want to find a more secure method. The window changes to the icon selection window. 6Choose an icon from the options and click the Okay button. Facebook tries to provide an option for lots of common group types. If you can’t find anything that represents your group, click Skip. 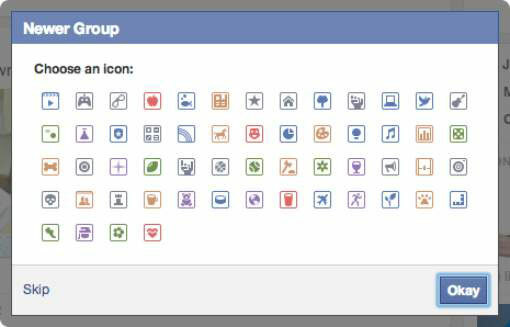 After you choose your icon and click Okay, you’re taken to your group’s Home page.